Its easy to tell if you’re looking at a gum plant. 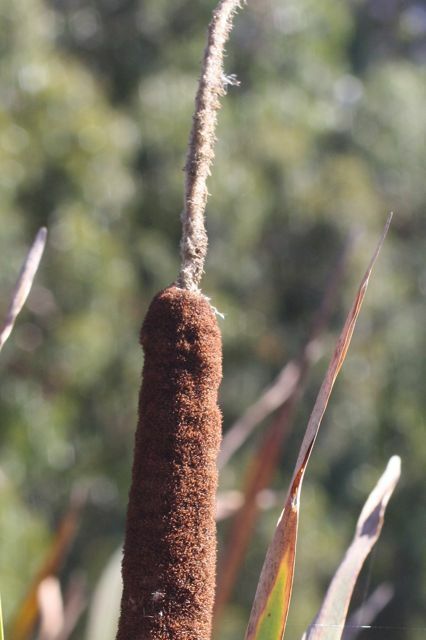 All the different species have big yellow daisy-like flowers perched atop a green nub that is studded with fleshy hooks. Before the young buds bloom they ooze a white sap that looks exactly like fresh Elmer’s glue. 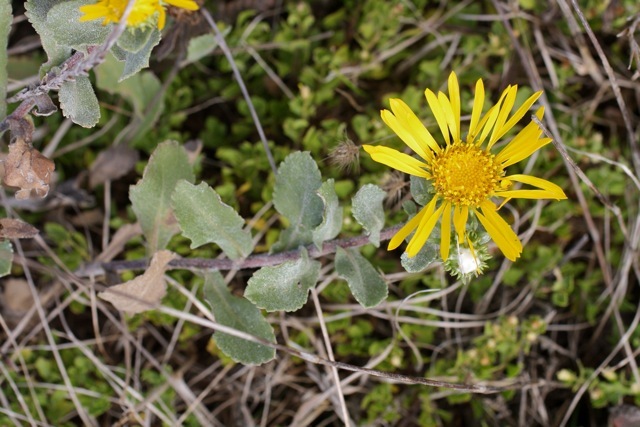 San Francisco gum plant (Grindelia hirsutula var. maritima) only grows near the coast, on hills and bluffs from Marin to Monterey. I spotted these specimens on a recent hike to Chimney Rock on Point Reyes. 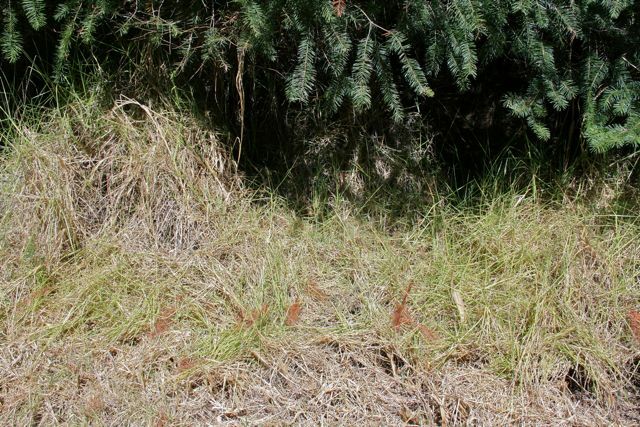 Distinguish this plant from its cousin, coastal gumplant, because it grows on the hills instead of the salt marshes–but mainly because it doesn’t have perennial woody stems. San Francisco gum plant can vary dramatically in size, from 8 inches to nearly 5 feet. The plants I saw had hairy leaves, but according to the Marin Flora the leaves are usually hairless (aka “glabrous” in botany-speak). Surprisingly, the Elmer’s glue doesn’t seem to have had any historical uses (that I’ve been able to unearth). 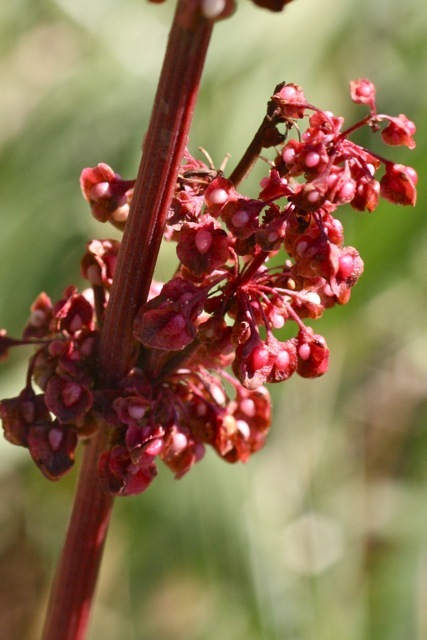 But the dried leaves and buds were used to treat bronchial conditions including asthma. 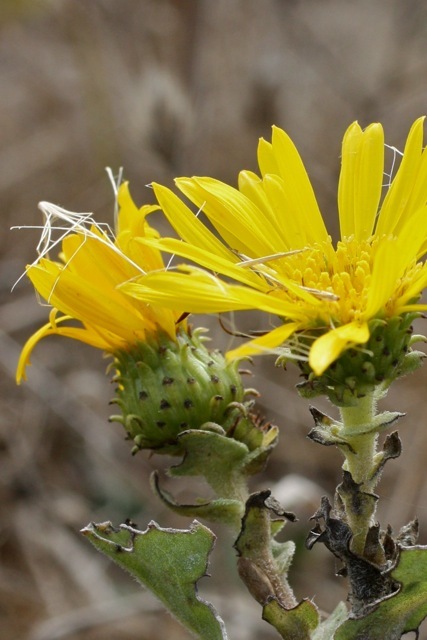 Though there are three different species listed in the Marin Flora, it’s worth noting that some experts think that they all are actually part of the same species, Grindelia hirsutula. A delicate parasol of tiny white flowers is punctuated at the center with one that is dark purple. This is Queen Anne’s lace, or Daucus carota. Though the plant looks a lot like poison hemlock, Queen Anne’s lace is actually edible–its other name is wild carrot. The roots are eaten cooked, or roasted for a coffee substitute, while the seeds are used as a flavoring. I personally have been too squeamish to try it, though the subtle details of the two plants are very different. First there is the central purple bloom. Second, wild carrot has a green stem stippled with hairs (while poison hemlock has a mottled and whitish stem). 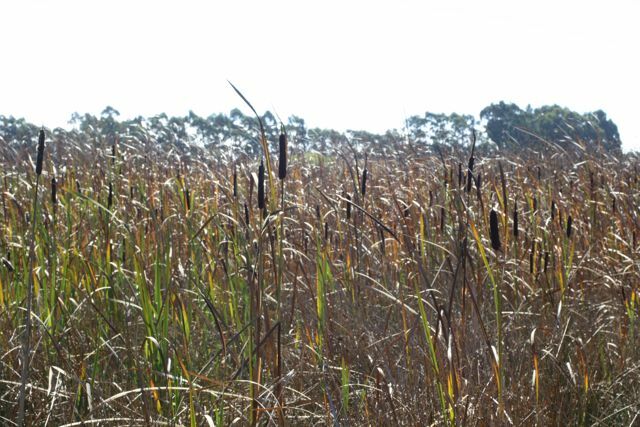 This non-native plant is native to Europe and Asia. Small golden spires are scattered across a coastal bluff. 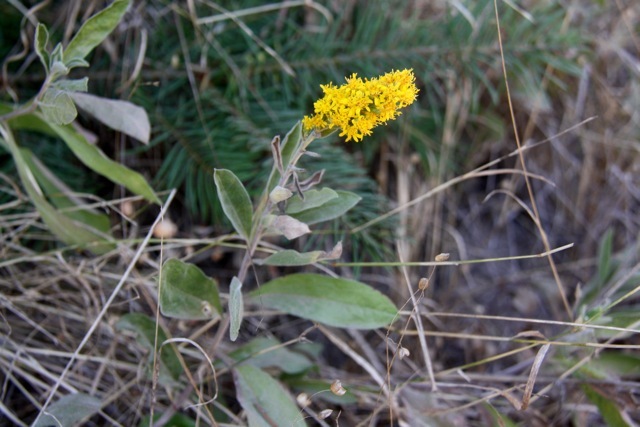 This little plant has soft gray-green leaves and many bright yellow flowers. California goldenrod (Solidago velutina) is an occasional sight in this area but I stumbled into a patch of it recently along the bluffs near Palomarin. This is one of the late-blooming flowers of the season, flowering mostly from August through October. It’s often blamed for hay fever, but that may be a myth–supposedly ragweed and other plants are more likely culprits. Goldenrod was used by Native Americans to keep hair from falling out, and also as a poultice or wash for sores, burns, toothaches and “feminine hygiene”. A thicket of green grass in the middle of a dense forest is a strange sight at any time of year but is especially odd now, in late summer. But here it is–going brown at the edges but still distinctly green (not so easy to see in these photos, unfortunately). 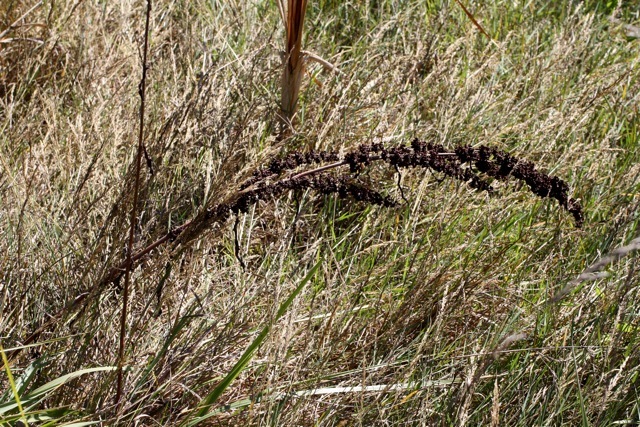 This is panic veldtgrass, or Ehrharta erecta, which is a nasty invasive. It isn’t picky and can grow in all sorts of places, forming a thick green carpet that smothers a diversity of other more delicate plants. Once you start seeing Ehrharta, you realize that it grows in many parts of Marin. 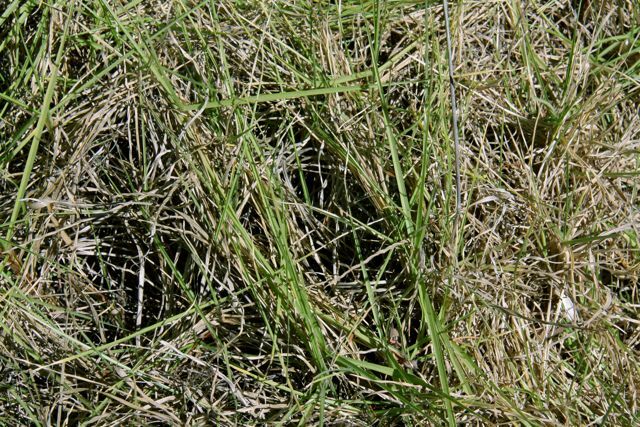 After it gets established it’s tremendously difficult to get rid of, so it’s a good one for homeowners to be aggressive about getting rid of if it shows up on their land. This pretty purple daisy prefers excellent views. 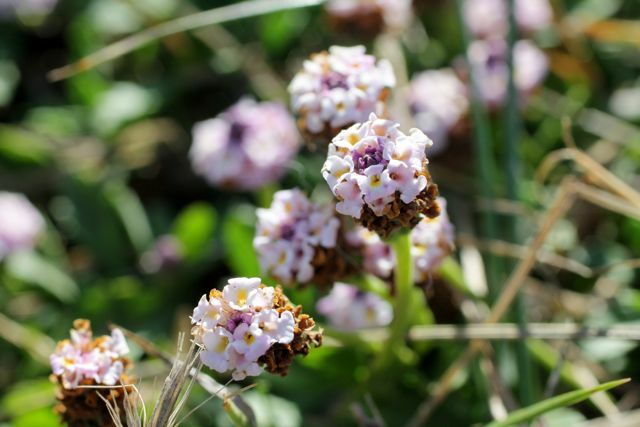 It grows along the coast, often clinging to rocky cliffs or sunbathing on sandy beaches. I photographed the ones shown here on the Point Reyes Peninsula, growing on the top of Arch Rock–a lovely vantage point looking down on the long stretch of coast to the north and south. 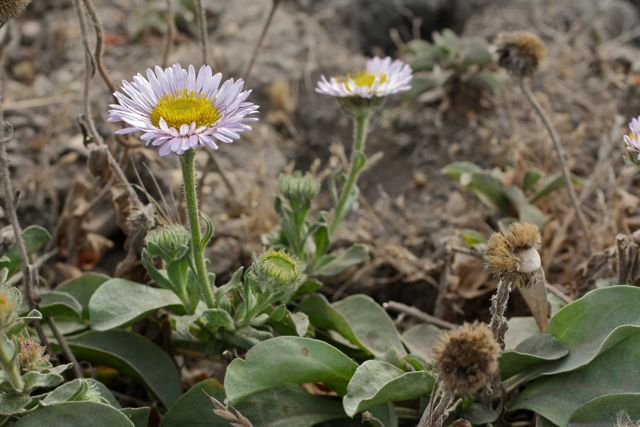 Seaside daisy (Erigeron glaucus) has rounded, grayish green leaves that are soft to the touch. The flowers heads are purple, ranging towards white or pink, with a yellow center. It’s native to California and Oregon, and it’s often seen in rock gardens as well as in the wild. 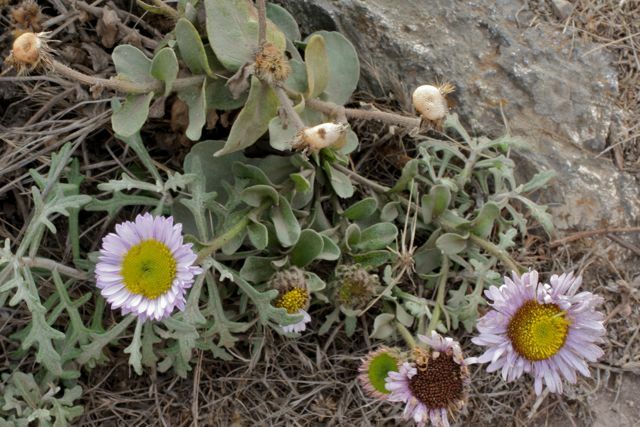 Other names include beach daisy and seaside fleabane. A low mat of green leaves speckled with small purple flowers is growing on the hard-packed soil between the trail and the water. This plant has the wackiest plant name I’ve ever heard: turkey tangle fogfruit! Phyla nodiflora has squat spires of small purple blossoms, each with a pale yellow splotch inside. The lowest parts of the spire bloom first, so as the flowers seem to be set on a ever-expanding brown pedestal as the season progresses. The whole package is only about a half an inch tall. 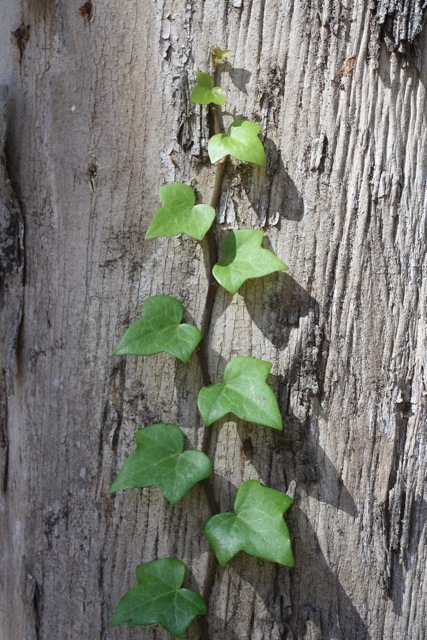 I’ve only seen turkey tangle fogfruit growing in a few places–always right on the edge of a trail alongside water. These photos were taken yesterday in Inverness, on the bank of Papermill Creek. It also grows along the edge of Bon Tempe lake, but has already finished blooming there. I always thought it was probably an escaped ornamental garden plant, which is exactly what the Marin Flora says that it is. But the CalFlora database lists it as native, and the Jepson lists it as native with the caveat that it is “questionably native” and may have been introduced multiple times from multiple places, including South America. Either way, it’s a quirky little plant to keep your eye out for! The leaves apparently are edible, and can be used to make a tea with a grassy flavor. It is used to treat colds and coughs. 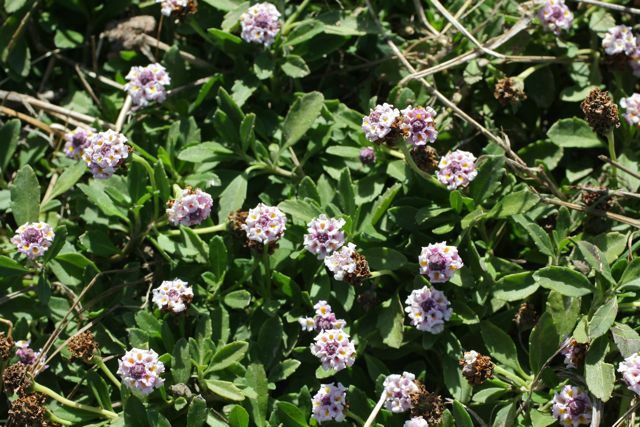 The plant is said to have antiparasitic properties and has been used to treat hookworm and other problems.